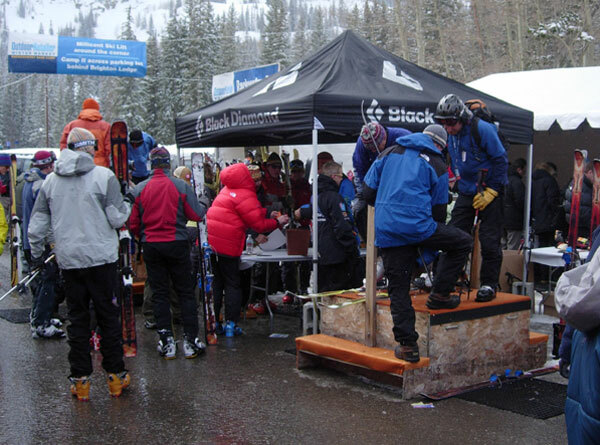 The Outdoor retailer show is in town, again. It comes twice a year, with the winter show a great opportunity to look at and try some of next year's gear. Prior to the show there's an on snow demo of snowshoes, skate skis, cross country skis, packs, intertubes and my favorite telemark skis. The rules change every year for the testing, this year no exception. 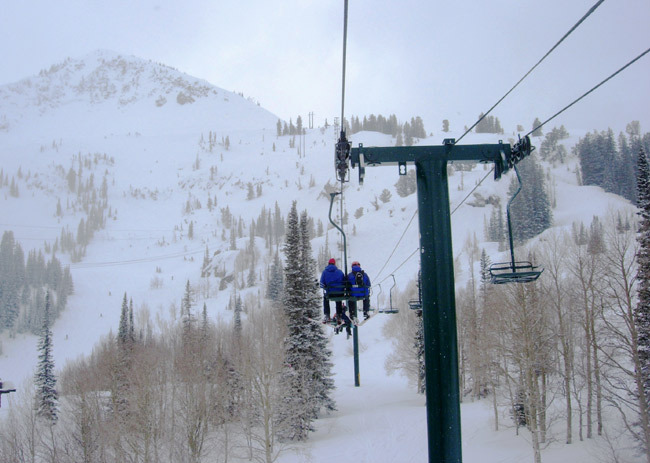 I had a bit of a struggle jumping through the hoops, but thanks to the friends out at Voile, I was able to secure a lift pass and gear tester tickets. The camp takes place at Brighton. The testing is done on an ancient two seater lift with minimal terrain options. Better than nothing. I decided with the snow conditions present, that a test of fat skis, the latest fad, should be done as the snow wasn't conducive. Best to test skis when the snow conditions dictate something else, so's a person learns how they handle. 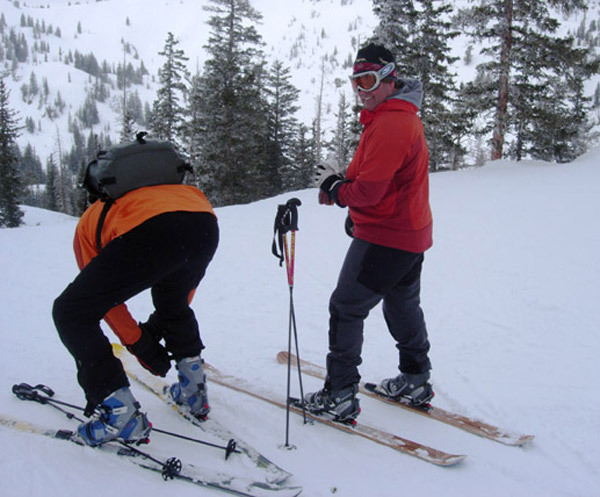 The first skis tried were something by K2 called the "Anti Piste." Big fat skis slightly larger than the Hippie Stinks, without the twin tip. 130mm at the tip if I remember correctly. Those were the only ones I got a picture of with a review of all at the end. While skiing around on the runs, I ran into a couple of fellows, responsible for one of my favorite internet chat rooms, Telemark Tips. They were there, also testing skis and interviewing some of the ski makers. I got a picture of both, although the view of Big Tim isn't the best, trying out a couple of the new Karhu skis. Tried to ski a run or two with them, but they had other things in mind. Saw em getting a bit of video of carc hucking by some of the up and comers.in the tele world. The staging area was interesting with all the booths set up for demos. Variable versions of demo set up. G3 was a pain, as though organized, it was overkill and I didn't have the patience. BD put everyone on stage, not a bad thing if one didn't fall off, during the adjustment process. I didn't do a very good job getting pictures, missing a shot of Kasha and Lesley Ross, also missing any action shots. Oh well. Suffered my first injury of the year when I went off trail, exiting the ski area and smacked a guy line, while traversing back, knocking me silly and requiring a visit to the medical facilities to make sure I hadn't broke anything. Stiff and sore with a bruise extending from neck to waist but nothing broke. 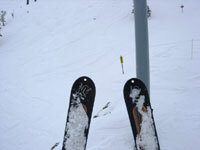 I will miss a day or two of skiing. 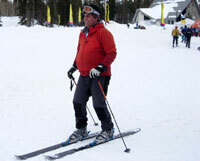 Here's a final picture of Mitch, appears to be having fun, headed out for a test of some new Volkls. K2 Anti Piste: Tested in a 174? Claim was a wide ski for the bc. Damn heavy and almost pulled me off the lift. Skied very well, stable and blasted through the crud. Fairly quick edge to edge, but wouldn't want to drag around outside the ski area. 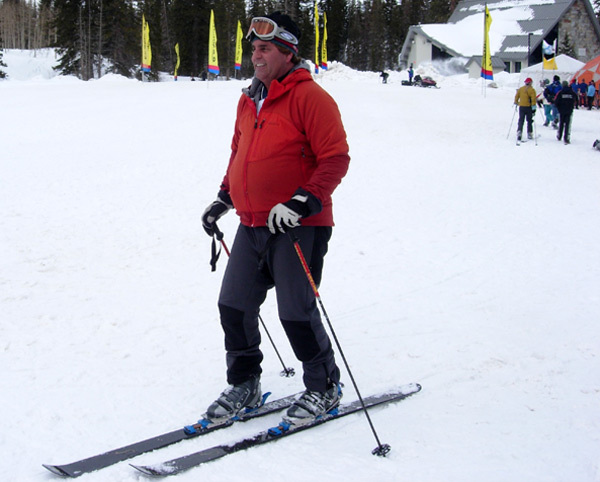 Voile Insane: Skied in a 180 since that was the only size. Great graphics and probably the lightest of the fatties. Got knocked a bit in the crud but weight allowed easy recovery.Too big for me, at least for the bc. I'd like em a bit stiffer and thought they needed a forward mount. Second favorite of the day. G3 Reverend: My favorites for snow conditions. Skied in a 177? Very nice skis. 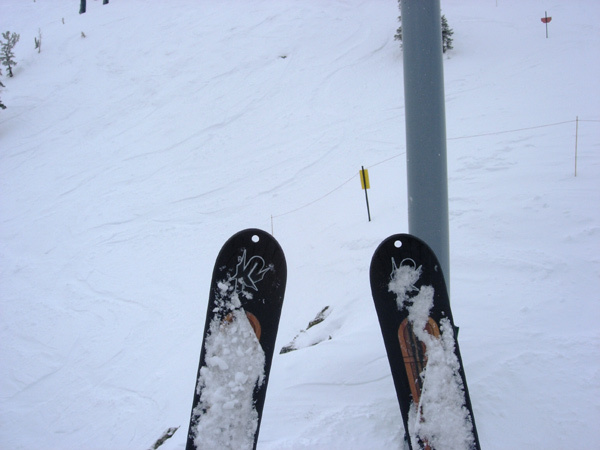 Edge to edge was great, held fine in the chokes of the things skied, not too heavy and could be skied at speed. A bit narrow compared to the rest, but the widest of the G3 offerings. Black Diamond Verdict: Skied in a 180. Over damped and sluggish. Skied just fine and could not find the speed limit in the terrain skied. Had to muscle through the chokes and slow coming around, even in the open. Heavy for the size. Probably a better ski for the northwest and California where the snow isn't the light and dry. Fisher 92: Twin tip skied in a 178. Not a bad ski, but unimpressive. Skied everything quite well and fun in the powder. I was wearing those when I got closelined. Wouldn't like the shorter length and don't need a twin tip. Atomic New Teledaddy: Skied in a 170 something. Didn't get the name but the new release of the teledaddy. Much improved from the red ones. I got a full description of the improvements, but other than a magnesium something or other, I forget the rest. Nice edge to edge handled everything quite well. Much better on the harder snow than previous version. Third favorite of the bunch. Would have liked to try a couple more, G3 Ticket, K2 World Piste new version, Karhu etc, but injury prevented it. Hope to make it next year.